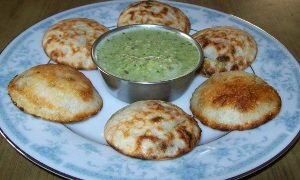 Gundaponglu paddu paniyaram spicy appam recipe is a South Indian recipe. It is also known as ponganalu in Telugu language. 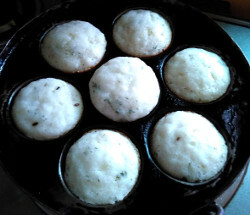 Made mostly for breakfast, paddu / appam is easy to make. It is made with idly or dosa batter which you made the previous day or you may already have in the fridge. 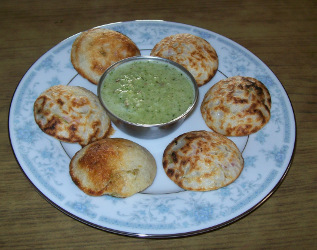 Like uttappam, paddu is made with 1-2 day old idli or dosa batter. Paddu is good to eat hot or at room temperature. So you may also pack it for lunch to school or to office. It is usually served with coconut chutney. You may also serve it with dry chutney powders or tomato ketchup. 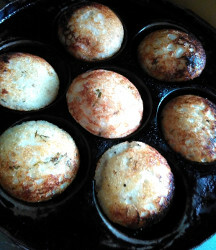 Paddu or paniyaram is cooked in a special pan which has round depressions. 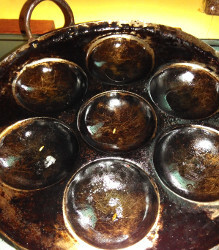 Traditionally, iron or cast iron or stone pans were used to make paddu. The pans are generally round with different sizes i.e. 3,5,7,9 depressions. Now a days, nonstick paniyaram pans are available. These may be round, square or triangles. The number of depressions varies according to size and shape. I have an old iron pan which works well for me. So I use that. green chili - 1 chopped fine. Salt - 1/4 tsp, more or less according to taste. Your idli/dosa batter may already contain some salt. Vegetable oil - as needed for shallow frying. For paddu, we need the batter which has thick pouring consistency. If using idli batter, you may use it as is. Just add other ingredients and made paddu / paniyaram. If you are using dosa batter (which is generally thinner than idli batter), you may need to add a little rava/sooji to the batter. and then add the other ingredients listed below. Add the batter to a mixing bowl. Add all other chopped ingredients to the batter and mix well. Keep aside. Heat the paddu/ paniyaram pan on medium heat. Once it is heated, keep the heat low. Add a few drops of oil to each depression in the paddu pan. Add about 2 tbsp batter in each depression. The quantity of batter will depend on the size and shape of each depression. 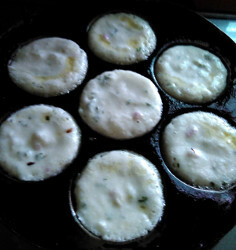 Cover the paniyaram pan and let the paddu cook for about 2 minutes. Check after a minute if the wet look of the batter has changed or not. 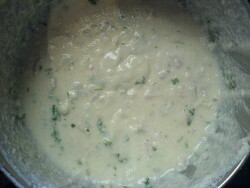 If the batter still looks wet, cover and cook for another minute. When you see batter has changed color and there is some browning in the edges, turn each paddu with a spoon or a blunt knife. Turn only when it is lightly browned on the bottom side. Otherwise let it cook for some seconds more. Once you turn the paddu, there is no need to cover it again. Cook the other side for about one minute more. If you wish, you may add a few drops of oil after you turn them, but it is not really necessary. I do not usually add oil again after turning paddu. When both the sides are done to your liking remove paddu with a spoon or tongs. Serve hot or at room temperature with coconut chutney or any other chutney.